Okay, so as NBA free agency officially tips-off your Dallas Mavericks have $8 million to spend on a center but have already missed out on Dwight Howard (Houston Rockets), Jermaine O'Neal (Golden State Warriors) and, apparently without even making an offer, Andrew Bynum (Cleveland Cavaliers). And with Chris Kaman haven flown the coop for the Lakers, it begs the question: What's Erick Dampier up to? Actually, no, it's not that desperate for the Mavs. Yet. But if owner Mark Cuban and general manager Donnie Nelson are to salvage what just last week promised to be an eventful, impactful off-season, they've got to plug Dallas' huge hole in the middle. Currently, the Mavs have only second-year Bernard James on the roster at center, though Brandan Wright is leaning toward returning. Other options: Greg Oden and his ravaged knees? Minnesota Timberwolves' restricted free agent Nikola Pekovic? 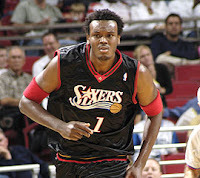 Samuel Dalembert and his offensive touch of a blacksmith? Let's face it, at this point we have no idea who will jump center for the Mavs on Openig Night in October. And neither do they. Oh, and if you're holding your breath for guard Monta Ellis, feel free to disappointingly exhale because Donnie told reporters last night it was "probably a long shot." Coming: G Devin Harris, PG Jose Calderon; SG Wayne Ellington; PG Gal Mekel; PG Shane Larkin. Going: C Chris Kaman; SG O.J. Mayo; PG Darren Collison; G Mike James; G Roddy Beaubois. Blow it up. Do it baseball style and let Dirk leave for a year so you'll get something in return. If the Cuban didn't hate the Spurs so much, I'm sure they would part with a couple of good prospects for a year of Dirk. I still say people are undervaluing Brandon Wright. Get him into the weight room so he can bulk up, and his energy can give them just what they need. Mavs got a title & now we watch their demise...just lke the Stars & Cowboys.